If you’re a tea drinker, you’re most likely curious about the safety of drinking tea during pregnancy. You probably want to know if there are any teas you need to avoid too. With all of the warnings about consuming caffeinated drinks during pregnancy, many pregnant mamas-to-be can be a bit hesitant to consume their favourite tea. So, is drinking tea during pregnancy safe? And if so, what varieties of tea are safe? No matter if you’d like to enjoy an occasional cup of herbal tea during pregnancy, or your usual english breakfast tea, we have the answers for you. BellyBelly’s Naturopath, Nicole Tracy of Nurtured By Nature has given the consumption of most herbal tea during pregnancy the tick of approval. “Overall, herbal teas are generally very safe to consume, and most often beneficial during pregnancy. This is as long as recommended doses are not exceeded. Because you’re drinking an infusion or decoction of the leaves, flowers or roots of a plant, it’s not as potent as consuming the plant in its entirety,” Nicole states. And in fact, according to Nicole, drinking tea while pregnant even has a few additional benefits! But of course, there are some teas which are best avoided during pregnancy too. “Drinking herbal teas during pregnancy is certainly a wise choice when compared with caffeinated beverages,” Nicole says. According to Nicole, caffeinated drinks have a diuretic effect, reduce nutrient absorption and deplete the adrenal glands. Meanwhile, herbal teas hydrate, provide easily assimilated nutrients and feed the body during pregnancy. They’re also packed with antioxidants and vitamin C which helps lower your anxiety and stress levels. Various types of herbal teas can also reduce morning sickness symptoms and even prepare the uterus for labour. Well, you sold us at ‘no more morning sickness’. So which teas are best for pregnant sippers? Here’s a list of teas which are safe to drink during pregnancy. Eases nausea (goodbye, morning sickness! ), aids the digestion process and relieves stomach issues. Ginger is a warming digestive herb, a circulatory stimulant, anti-nausea and great source of zinc. Provides high levels of water soluble iron, magnesium and calcium. Nettle leaf tea is described by Nicole as being a brilliant nutritive tea to sip whilst pregnant, especially as you near the end of your pregnancy. Stick to one or two cups a day, or drink in a blend with other herbs. One of our favourites at BellyBelly! Raspberry leaf tea prepares the uterus for labour due to its rich mineral content. It also helps to prevent post-partum hemorrhage due to its gentle astringent effect. Raspberry leaf tea was traditionally used in late pregnancy to prepare for birth and breastfeeding. Raspberry leaf is also a galactogogue, so it supports breast milk production. According to Nicole, this herb is also high in calcium, magnesium and iron. Raspberry leaf tea is safe to drink from the second trimester onwards. “I usually recommend women drink one cup per day from 26 weeks. Then they can build up to two cups at 30 weeks, three cups at 36 weeks and 3-4 cups from 37 weeks.” Nicole suggests. See some popular, top-rated raspberry leaf tea here. “This tea is a wonderful support in late pregnancy when fluid retention is an issue,” Nicole says. She explains that dandelion leaf tea is high in potassium and has a gentle but effective diuretic effect. It’s also considered to be a kidney tonic and gentle digestive, and is alkalising. Nicole suggests adding dandelion leaf to another tea such as spearmint or chamomile, as it has a slightly bitter, grassy taste. Spearmint and peppermint tea is great for relaxing your stomach muscles, to help settle an upset stomach. It also helps with nausea and vomiting, which is common in early pregnancy. Spearmint is preferred to peppermint tea as it doesn’t increase reflux (as peppermint can). Both are safe in pregnancy, and are safe alone or in blends. Rooibos tea is highly recommended in pregnancy! 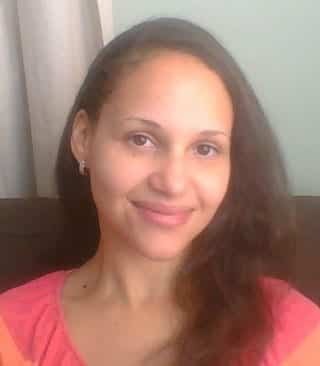 Nicole switches most of her die-hard tea drinkers to rooibos during their pregnancies. Of all the herbal teas, its taste is most similar to traditional black tea. Rooibos is caffeine-free, contains calcium, magnesium and loads of antioxidants. It also has positive effects on digestion, and can ease colic and reflux. Unlike black tea, rooibos is not high in tannins, which reduce nutrient absorption. Children can also drink rooibos. It’s lovely with milk of your choice and a little honey. Rooibos is also a great base for caffeine-free chai or iced tea. You can now purchase special tea blends just for pregnancy! 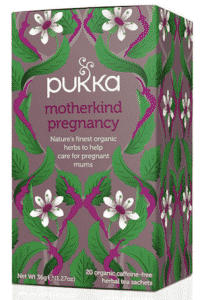 Pukka’s Motherkind Pregnancy Tea is a delicious blend of sustainably sourced, supportive herbs traditionally used during pregnancy, including Raspberry Leaf, Nettle, Chamomile, Peppermint and Shatavari. Pregnant mothers-to-be give Motherkind Pregnancy Tea the big thumbs up, rating it a 4.7 out of 5. According to research, caffeine consumption during pregnancy (particularly over has 200mg) has been directly linked with reduced birth weights. BMC Central has published research this year (2013) which again produced results showing that caffeine is implicated with low birth weight. They found that for a baby expected to be of average birth weight (3.6kg), it equated to a loss of 21-28 grams per 100mg of caffeine consumed per day. Caffeine also extended the length of pregnancy by 5 hours per 100mg of caffeine per day, however if you’re also a coffee drinker the news is even worse! Coffee was associated with an even longer pregnancy – 8 hours longer for every 100mg of caffeine per day. This research illustrates the importance of keeping an eye on your caffeine consumption during pregnancy. For this reason, teas that are particularly high in caffeine should be restricted while you are pregnant. Black, e.g. english breakfast, earl grey, ceylon etc. You would have noticed that green tea is on the restriction list. This is because there is still some discussion concerning how safe green tea is for pregnant women. Curious about drinking green tea during pregnancy? Green tea contains high amounts of caffeine and is said to reduce folate absorption. So if you’re a green tea addict, consider limiting yourself to maximum one cup a day. Use that as your caffeine allowance, or try sourcing a caffeine-free green tea. Chai tea contains caffeine, but 1-2 cups per week is okay. You can purchase dandelion chai at organic shops and healthy cafes, which is caffeine free and great for your liver. Chamomile tea during pregnancy is fine as long as there is no history of hayfever. The chamomile herb is from the same family as feverfew, which isn’t recommended during pregnancy. You’d need to drink a huge amount of chamomile to have any issues. Nicole also advises to steer clear of rosemary, oregano and majoram in large amounts. Otherwise, stick to the safe tea list and feel free to sip away and spend your pregnancy days in a tea-ensconced bliss! If you’re a coffee drinker and wondering how much you can have, check out our article here. Please speak to your naturopath or herbalist if you have any concerns about which teas are safe to drink during pregnancy. I’m 8 week’s pregnant going to my 9th week on Thursday. and since I’ve conceived I noticed I drink a lot of tea so is it okay to drink JOKO? And why shouldn’t I drink acid? I tried rooibos and every time I drink it I get sick so I bought de-caffeinated five roses. Is it bad or good. Decaffienated teas may contain traces of the chemicals which were used to remove the caffeine. You’re far better drinking naturally caffeine free teas. How many weeks are you? You may find that it gets easier to drink the Rooibos once you get past 12 weeks. Good luck. In the article above, she tells of how good raspberry leaf tea is for pregnant women. But the Celestial Seasons Rasberry Zinger is not from the leaf but flavored from the berry. It’s the leaf that is so good for you. You should google to find out about strawberry. Anyone know about mint herbal tea? Does anyone know if spearmint is like peppermint? If you read the article spearmint and peppermint are on the safe list of teas to drink. My doctor also said it’s fine. Is 7 blossoms tea ok to drink during pregnancy? Is red clover tea safe to drink while pregnant? I read that it should be avoided. I would have thought it’s good for blood sugar regulation… But I haven’t specifically looked into it. This is just fear mongering about caffeine unless there is some perspective. One cup of black Earl Grey tea steeped 5 minutes is at or less than 40 mg of caffeine. I drink 1-2 cups a few times a week and my MD said that is fine. 1 cup of starbucks coffee is also ok. Just know that caffeine is also in chocolate and some other places like Coke so it adds up. I agree – tea of any kind tends to have considerably less caffeine than coffee. I try to just have 0-140 mg caffeine per day. I see peppermint tea, but is spearmint tea ok? In the article it clearly states spearmint and peppermint are on the ok list to drink. Is manzanilla chamomile ok to drink when pregnant? I don’t know about the manzanilla part, but I read chamomile is actually good (in moderation). Is five roses tea good or not? Does anyone know about Tetley Tea? I’m 12week pregnant and kind of addicted to tea. I crave for tea but after reading these all, i’m scared. Please kindly response about the Tetly tea. Is it highly caffeinated? I read celestial seasonings tea is rated as having good ingredients. You’ll find that they often have few ingredients. That’s all I’ve been drinking. Terkel tea is just a standard black tea, and black tea is addressed in the article. Short answer…it is high in caffeine so moderate. Do your research. What the F.D.A. and most western doctors say to do are not always in our best interest. I am an M.D. and have practiced for over 20 years. Unfortunately our western society is known to cave under fear and pressure that isn’t always backed by science. Anything in moderation… I know plenty of women who drank moderate amounts of coffee, green tea, oolong tea and other types of tea during their pregnancy and were fine. Just keep a balanced mind and approach to your diet. Get plenty of good, non-flouride and chlorine free water, plenty of organic vegetables and sleep. We are the only country crazy enough to add fluoride or anything for that matter into the water supply. How can it then be avoided? Water filters don’t remove it. Reverse osmosis filtration specific to your water testing,, steam distillation is the best just add minerals or marine supplements to diet, , source water from Europe instead for bottles. Btw, there’s a lot more than fluoride in the water, I highly recommend RO system with UV sterilization and glass utensils ;). Steam distillation is best, but slow, and pricey! I think its important to note that many teas (black, green, white) are high in fluoride themselves. It depends on where the teas are grown and age, of course. I switched to just herbal tea to avoid the extra fluoride. We also recently installed a reverse osmosis system for drinking water, at least. Home systems are very expensive, sadly, and reverse osmosis is kind of a wasteful process so I’m a bit torn. I can’t wait to be back in the country and monitoring my own well again. So does earl grey tea have lots of caffeine. Like can I drink a cup a day or what. Just curious because I love ❤ earl grey tea. I recently visited our local tea shop to buy some ginger tea for morning sickness. During our chat she was advising me on teas to drink once the baby is born and said to steer clear of peppermint tea as it inhibits milk production. Can you comment on this? Yes! Peppermint will dry up your breastmilk! Sage also! It is safe to drink lipton tea. I’m 10 weeks pregnant can I drink chamomile tea is it safe?? Hi how about lemon grass herbal tea during pregnancy is it safe? No the the Encyclopedia of herbal plants says to stay away from lemongrass, licorice root, turmeric, marshmallow root, elm bark, wild cherry bark, yarrow, , juniper, mayapple ( also known as Satan’s apple or mandrake), pennyroyal, rue, tansy,& cinnamon. Most of these plants where used to abort or cause miscarriages. Am 10weeks pregnant is it safe to drink Rooibos tea? What are the side effects (of liquorice tea)? It can induce uterine contractions. Great if you’re overdue, not so great in the rest of the pregnancy, when you’re trying to keep baking. I’ve been drinking turmeric ginger tea and I just realized the 4th ingredient is organic licorice. I’ve stopped drinking it now but will this hurt the baby? I’m 4 weeks and I’ve been drinking about a cup a day the last 2 weeks. I’m very worried! Is it safe to drink Rooibos Chai Tea? What about organic vamboo tea? Can I drink that? Can I drink Bamboo tea? I have oolong ans green tea but since I can’t drink those I only Bamboo as my last option before I buy the teas I can drink. Don’t drink green tea unless it’s caffeine free. Green tea can contain up to twice the caffeine of normal tea so that would be max 1 cup a day. I am now on a mission to find a tea that I can drink throughout my pregnancy because my decaf coffee is no longer making the cut 🙁 how about Rooibos Chai? Caffeine free. The ingredients are so follows: Herbal rooibos, coriander seed, fennel seed, cinnamon, cardamom, nutmeg, cardamom flavor. Contains natural flavors. Safe?! I am also tempted to indulge in some Hot Cinnamon Sunset tea every once in awhile because, yum! Just wondering if apple cinnamon tea is safe to drink. I’m currently 9 weeks. Hi, my wife is over 30 weeks. Can she take natural lemon grass tea? Is Lipton stress less tea safe? i used to drink senna tea/biguerlai tea for my constipation. Every night i take a cup of senna tea. Accidentally i got pregnant and got to discover my pregnancy at 10weeks,right after i quit drinking tea. Im worried if that could affect the development of my fetus? Hi, im trying to switch from coffee to dandelion “brew”. It contains chicory root. I dont see chicory listed in this article. Is it safe? Other websites say its not but not sure if they are correct?